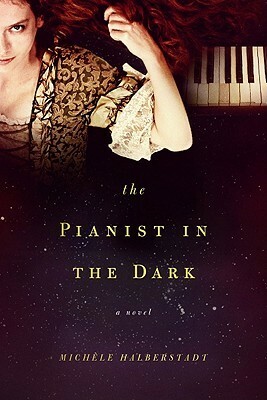 Based on the true story of Maria-Theresa von Paradis, the only daughter of the secretary of the empress of Austria, and her interactions with Franz Anton Mesmer, a doctor and the source of the term mesmerism, The Pianist in the Dark by Michéle Halberstadt is ultimately about the price of sight. Maria-Theresa was musical prodigy. Blind from unknown causes since she was about three, she played beautifully and with great passion before the court in Austria. She was filled with a talent that eclipsed her disability and the ability to hold her audience spellbound. She seemed to have the world at her feet. Her father, however, could never resign himself to accept her condition and subjected her to the ministrations of doctor after doctor. None of whom could identify the source of the problem or offer any solution. After giving his word to his daughter that he would stop trying to cure her, he meets Franz Anton Mesmer and manipulates events so Mesmer makes the offer to treat her himself. She is suspicious at first--she has submitted to too many "treatments" at the hands of "experts" who were only out to forward their own careers. After all, should they have succeeded, they would have won the gratitude of the Empress herself. But Maria-Theresa becomes convinced of Mesmer's sincerity and agrees to allow him to perform his "magnetic" treatments. And they work. Soon the girl who didn't, as the introduction says, "know the color of the sky or the shape of the clouds, [didn't] know the meaning of blue or red,or dark or pale" begins to see shapes and colors.She also, through Mesmer, begins to know the meaning of love and passion. But it is a short-lived victory. The other doctors, jealous of Mesmer's apparent success, begin to ridicule his methods and to spread rumors that his relationship with is patient is unorthodox. If he did not have power over her as a lover, that she would not "see" as well as she does--that it is only his "amorous suggestion" that influences her. What began as an incredible journey towards sight and love, becomes a horrible nightmare. She learns that everything in life seems to be motivated by power and greed. Even Mesmer is ready to give her up when his reputation is at stake. As she says to him late in the book:Cursed! I am cursed! My blindness made them suffer and my recovery has made them mad. Even you prefer me ill to cured. Life is so cruel! It allows me to discover passion and harmony, then steals it away as if it were a mirage! What good is seeing if all it does is open your eyes to the truth of human nature? Have I been through all this just to come eye to eye with cowardice, lies, and trickery?In the end the price of seeing is too high for Maria-Theresa. She chooses to return to darkness and devotes herself once again to her music. Disappointed by her parents who could not accept her for who and what she was and disappointed by her lover who could not accept what he had helped her become, she decides for herself what her life will be.In this short novel, Halberstadt has given us a story of awakenings and choices. The writing (or perhaps the translation) is spare and direct. There is nothing superfluous in the descriptions. And the story flows almost perfectly. My only minor quibble comes with the romantic scenes between Maria-Theresa and Mesmer. They are a bit over the top--soap opera and bodice ripperish--but the chapters are short and fortunately this portion does not last long. Otherwise, a nicely done peek into history and an interesting look at one of music's female blind prodigies. Three and a half stars. Over the years, I have become more and more frustrated by the apparent death of the editor. Whether it's typos or bad grammar or the use of ten pages to tell the reader what can be told in one (I won't name any names, but surely we all know plenty of examples), it all speaks to the fact that editing seems to have become a victim of profit margins even as successful writers have begun to flex their muscles with their publishing houses. So for that reason alone, this was a wonderful, wonderful book. Not a wasted paragraph. Not a wasted word. Instead, a complete story is told in what is essentially a novelette. And the story is interesting enough: a girl born into privileged circumstances in 18th century Vienna loses her sight at age three, but it doesn't stop her from becoming a musical virtuoso and friend of a guy named Mozart. In fact, the only threat to her skills at the keyboard comes in her seventeenth year, when a certain doctor (viewed by many as a charlatan) treats her condition, which is apparently more psychological than physical in nature. I won't spoil things by saying whether the treatment is successful or by describing what happens afterwards, but it all adds up to the story going in a direction that I didn't anticipate. In terms of content, it is much more about the characters and their thoughts and motivations than it is about plot advancement. Or to put it another way, you won't mistake this one for an action thriller. And while translated stories often suffer when the translator's shortcomings are exposed, that is not a problem here. All in all, a good read, even if the apparent mindset of the author once again reminds me that there really *are* some general differences between a typical European author and my American self. I picked this up out of the New Fiction section of our library mostly because it was an incredibly slim novel - 140 pages. I was just intrigued at how a novel of that length would be. And I guess it was sort of what I thought it would be - it felt like an expanded short story. The premise is interesting - a blind upper-crust daughter of a government official in Mozart-era Austria is treated by Franz Mesmer. One is lead to believe that all the characters were actual historical figures (I know Mesmer was) and that this is an imagining of actual events. But it's just an odd story with the worst ending I can recall. Literally, the last three lines are, "In 1800, she began teaching. She created a music school for girls in Vienna in 1808. It is there that she died on February 1, 1824, in her sleep." Huh? Even at 140 pages I can't much recommend this one. I really enjoyed this book, although as a general rule, I never read books about real people or events that are made into novels. When I chose this book it was solely based on the fact that in the last month I have read two other novels by her and enjoyed them both. It was only when I started this third book of hers, that I discovered it was based on the blindness and attempted cures of Maria Theresia from Vienna.It was so good I kept going, and I am glad I did, as it ranks highly with her other two novels. I do not think there are anymore that I can get that have been translated. My French is not good enough to read an entire book in it and that is her native language and any books found here have been professionally translated. She is excellent ! This is the fictionalized tale of piano virtuosa, Maria-Theresa von Paradis, who played for Austrian royalty in the late 1700s. Despite her recognized talent in piano, her father is determined to cure her blindness. At the age of 17, Maria-Theresa meets Franz Anton Mesmer who takes her into his home and treats her eyes with magnets and succeeds in bringing shadows into her vision.With a heavily-used thesaurus at her side, Halberstadt tries to turn a history lesson into a novel. The 80-page short story falls short in both character and plot development. I believe there was potential here for a novel but this isn't it. Grade: C-LOVED the premise, but unfortunately the storytelling was really lacking - awkward POV changes, strange and inconsistent verb tense choices (I almost DNFed by chapter two), and a whole lot of telling instead of showing.Rather than allow the amazing character of Maria Theresia to tell her own story, the author veered between dry historical recitations and long philosophical monologues. A few truly emotional scenes, like the confrontation with an opposing physician and brief moment during a Paris concert at the end of the book, redeemed this story slightly, but not enough recommend it. That's the last time I believe the Good Butler's recommendations. This "book" wasted my time. A novella? I enjoyed this as a quick read about a significant period of time in a young woman's life as she's coming of age. Whilst it's set in the 18th century, and has foundations in the Viennese Court and built around her prodigious talent - it's a fundamentally timeless story. What a superb book! Michele Halberstadt tells a more enthralling story in less than 200 pages than many writers can tell in 600. What adds to this gem that is that it is based on a true story, the fascinating life of Marie Theresia von Paradis, a beautiful and blind prodigy and student of Salieri and friend of Mozart.Maria Theresia has been blind since a child, believed to have been caused by trauma, but the author leaves you to decide what it might have been caused by. All her life renowned doctors, specialists, and quacks have tried to cure her blindness, only leaving her highly nervous, frail, and emotionally withdrawn. Nonetheless, she has grown into a remarkable beauty and tremendous talent, sponsored by the Empress of Austria and taught by the finest musicians in Vienna.Just when Maria has resigned herself to the dark, Franz Anton Mesmer, a handsome and brilliant German physician, convinces her over-protective parents that he can cure her using the daring treatment he has invented, the forerunner of modern hypnotism.Mesmer not only begins to help Maria regain her sight, but gives her the keys to unlock her gilded and suffocating cage, and despite their differences in age and background, the two embark on a passionate and intense affair which threatens to destroy them and everything they have worked for.Wow. Halberstadt can WRITE. She has done her research, written with fluid, exquisite prose and packed a heady emotional punch into this little novella that is definitely not so little.I highly, highly recommend this book to anyone who loves reading fiction about obscure historical figures, musical prodigies, unusual love stories, and courageous people who triumph over physical disabilities. "Man is more attractive when he is left to the imagination"So goes the opinion of Maria Theresia van Paradis also known as the "Blind virtuoso" she was an accomplished pianist in the court of Vienna. She was friends with Mozart and others of her time. This book details the way that one man wanted to "cure" her blindness with a new found medical technique. Yet even the details of the procedures he used left me skeptical. And Maria Theresia found that reality wasn't as pretty as she thought it might be. One could say this was more about self-discovery then anything else, but I found it to be somewhat satirical too. It took reading between the lines, and knowing that many of the faults of her world are still alive today. Wouldn't it just be better if we were all blind to reality. On a side note- I had to be very patient when reading this book and the end well it was blah. Oh the author could fill the pages with words, that could leave the reader with a somewhat fuzzy perception of what was going on, and this may lose some people along the way. The man behind the word “mesmerize” and the young girl he tries to cure of blindness. She is a piano protégée in late 18th century Vienna. He is a doctor who believes in “animal magnetism.” She falls in love with him. He tries to save his professional reputation. They’re both victims, in different ways, and power shifts quietly.At different times, I felt sorry for both of them and disappointed in both of them. Neither character came alive to me, and I was completely unmoved by their affair. I didn’t get a particular feel for the time and place, even though Mozart and Benjamin Franklin appear on the edges of the story. Except for some improbably long speeches by the pianist, the writing is lean and detached. The writing style is what I found the most interesting, because it contrasted so strongly with the guts of the story. Imagine the story of your greatest love, biggest heartbreak, being written up by the Wall Street Journal.This is the kind of book to read in one sitting at a café on a rainy day. The Pianist in the Dark is the first novel published in English by writer Michele Halberstadt, and I believe that perhaps it was the linguistic barrier that made this book nearly unreadable to me. The book itself is a fictionalization of Maria-Theresia von Paradis' relationship with Doctor Franz Anton Mesmer, but it doesn't read like a story so much as it does like a skeleton. Each chapter in the book is only a few pages long, a snapshot of an emotion without very much development of the story the author endeavors to tell. I feel as though I'm reading an embryonic rough draft that the writer hasn't yet fleshed out rather than a published historical novella. Perhaps it is for this reason that I couldn't connect with the characters in the book. I wasn't invested in the development and degradation of their romantic relationship, and I didn't care about Maria-Theresia's progress. Great story - it is about the blind daughter of the Von Paradis family - Maria-Theresa. She goes blind at the age of 3, and her father, who serves as the secretary for the empress of Austria, takes her to many doctors to find a cure for her. She finds that she is quite a Pianist as she grows up. She then is sent to live with Dr. Mesmer, where she falls in love with him and he helps her to start to see shadows. One thing she does not realize is that getting her eye sight back takes away her ability to play the piano. She must make a choice..... Based on a true story and set in the late 1700's. If you are looking for a good but short book, this one is perfect. The story summarizes the life of Maria-Theresa, a pianist who lost her site at the age of 3. For fifteen years, she was blind, and during that time, mastered the piano in nearly the same ways as Mozart. Her fathered forced upon her several doctors to try to cure her blindness before she asked him to stop. The final doctor, whom she agrees to herself, is successful in helping, however it affects her ability to play. All the while, her emotional and physical trials are outlined for us in the story. It is a story of innocense, experiencing love, and determination. Was a pleasant diversion on a lazy Saturday afternoon.Blind pianist in the court of the Empress of Austria. She is "cured" by the (in)famous Anton Mesmer. I guess the only part that bothered me was that she made extreme choices re: her body based on what could be construed as a failed love affair. I could see how someone could look at this and interpret that this woman was so influenced by strong male figures in her life, was possibly even devalued by them. But the argument could also be made that she made decisions about herself based on her becoming a strong-willed and independent woman. YMMV, I guess. I'm not sure what went wrong here.. This book, the ebook of it, went on sale for Cyber Monday and I bought it.. Well, apparently the kindle edition is not the entire book, but seems to be an abridged version (approx 100 pages.. I can tell by how quickly the percentage went by) with all the dialogue taken out. I read two chapters? And not a word of dialogue. As is normally the case with translated books, it's all telling, no showing. I bailed. Interesting. I had never heard of Maria-Teresia von Paradis before, but now I want to know more about her. This was a good introduction but it was lacking. I felt that it glossed over a lot of things. That could be because of the length of the story or it could be because of the style Ms. Halberstadt decided to use. In any case, I will be looking up more information about this virtuoso pianist who rivaled Mozart. The story of a blind pianist who was a student of Salieri's and a friend of Mozart's. It was a quick read, with short chapters. Unfortunately, I assumed that the novel was about music. But it was actually about the pianist's blindness, the attempts to cure her, her relationships with her parents and her doctor, and her feelings about all of that. So I was disappointed in the book. But it was well written. I was disappointed at the lack of historical reference (yeah she gave me some dates but I'd be interested to see more interaction with Mozart, etc.) but I was intrigued by the writing. Most notably when it came to description, especially of feeling. I like the story and its simplicity and I'd recommend this book as a quick way to grab your attention. Well, always so interesting to read a musician-book. Didn't know anything about this lady and wow, what a life! Her life was like an opera. Surprised that there haven't been anything of that yet! It's only interesting for historical purpose so I won't recommend unless you are a musician. A pretty quick read. This story was ok. I think the words themselves are beautifully presented; I just didn't care much for the storyline. It was hard to like either Maria-Theresa or Mesmer, both of whom, incidentally, I had no idea were based on real historical figures. This was a good book, well- written, even though the prose could get very stiff sometimes. Very short. I'm a little confused as to whether it's based on historical people. The book was almost like an outline or an idea that could've been fleshed out into a longer novel. Recommended by Head Butler. Very short too! "The Pianist in the Dark:Two weeks after I wrote about this short, wonderful novel, several of you have written to tell me how much they enjoyed it. That’s happened before, but never so soon." The author gives us great insight into the loss of sight. I simply loved the characters and enjoyed the story. Reading this novel shows how someone with special talents can get through almost any horrors to come out a winner. I found it short and very sweet. I needn't sum it up more than that. It was nice to read before bed and it made me feel for Maria Theresia. What an inspirational woman and brave. Giving up on sight to dedicate herself to the music she so passionately loved. I read this fictional historical novel in the hopes.that it'd inspire me to fall in love with music all over again. I think it has indeed made me want to play Mozart's piano compositions better. Interesting read.